Medieval Musical group you will be presented with a very broad range of music played on the hurdy gurdy and hammer dulcimer and presented in a lively theatrical format with players in period costume. 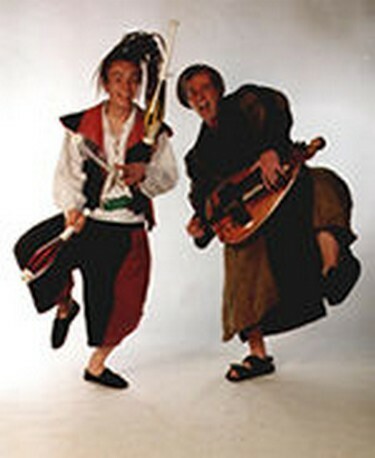 MEDIEVAL MUSIC (COSTUMED PERFORMANCE) The Grinnigogs play the funkiest fusion of Medieval, Celtic, Arabic, Andalucian, music designed to get feet tapping and bodies dancing. The band features authentic medieval instruments including:Hurdy-Gurdy, Hammered Dulcimer, African Percussion, Violin, Bag-pipes and Shawms. Vibrant, celebratory and passionate this music is wild, exciting and different. Archaic melodies combined with tribal instruments and a late twentieth century dance aesthetic makes this one of the most exciting and unusual bands performing in Europe today.The Grinnigogs provide an organically grown global dance groove from the dawn of time to celebrate the end of the millennium. A truly up-lifting deeply spiritual experience.Expect to dance! In addition to the big band The Grinnigogs can provide solo-ists and duo's. They can work from a fixed spot or as strolling players. They can perform acoustically or with amplification.